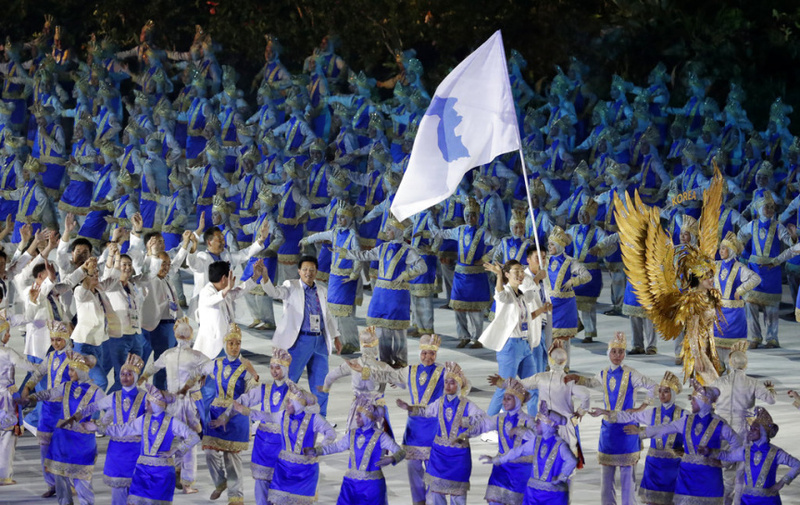 JAKARTA, Indonesia (AP) — First it was the athletes parading side-by-side in matching uniforms behind the "unification" flag carried by South Korean basketballer Lim Yung-hui and North Korean footballer Ju Kyong Chol. Then it was an image of South Korea's Prime Minister Lee Nak-yon and North Korean Deputy Prime Minister Ri Ryong Nam hand-in-hand with their arms raised high that grabbed the spotlight at a spectacular opening ceremony for the Asian Games on Saturday night. The two countries, still technically at war after their 1950-53 conflict ended in an armistice, have fielded 60 athletes in combined teams in three sports — including women's basketball — along with larger contingents for their respective national squads at the 18th Asian Games. It was a virtual repeat of the joint march involving athletes from the North and South during the Winter Olympics in February in the South Korean ski resort of Pyeongchang — but without the gloves, parkas and fur hats. The setting this time was distinctly tropical as about 42,000 people packed the Bung Karno stadium in the Indonesian capital for an elaborate show highlighting the diverse Indonesian culture. It began with a slickly produced video portraying Indonesian President Joko "Jokowi" Widodo stuck in traffic — a witty play on one of Jakarta's major challenges in hosting the games — donning a black helmet and jumping a motorbike over a ramp to reach the stadium in time. The motorbike shown in the video sped into the stadium and its helmeted driver disappeared into a tunnel moments before the real Jokowi appeared in the VIP area. Much of the stadium infield was filled with a rainforest-covered volcano scene that formed the backdrop for a show based on air, earth, wind and fire themes and featuring thousands of performers representing the dozens of ethnic groups in Indonesia, a country of more than 260 million people. It concluded Susi Susanti, the 1992 Olympic badminton gold medalist, igniting the cauldron. Susanti was Indonesia's first Olympic champion, and she was the final torchbearer on Saturday before triggering a spectacular eruption and lava flow. Organizing committee chairman Eric Thohir said the games would highlight Indonesia, the world's most populous Muslim nation, as a model of harmony and emphasize the diversity of Asia. "We are all here to celebrate our diversity, to celebrate our differences, to celebrate our humanity," he told the crowd. The other obvious theme was unity. More than 11,000 athletes from 45 countries and territories are competing across 40 sports at the games, which are being co-hosted by Jakarta and Palembang. Aside from the rousing applause for the Koreans, teams from Palestine, Syria, Taiwan and Indonesia received extra bursts of support from the crowd. Tensions between the Koreas have ebbed this year with a historic meeting between their two leaders at the heavily fortified border. Korean spectator Hwang Miri said the sight of the athletes marching together made her feel unification of the two countries was possible in her lifetime. "Looking at all of these people working together and playing together, even walking all together in this unified uniform and the unified flag," Hwang said, "It is such an enormous feeling."